This is also a moment to learn from our experiences, build on the progress made so far, and look into the future – to the next 20 years – as our journey continues. Cars have disappeared, because people are moving about in hovering drones, or “pods,” which elegantly avoid each other in the morning rush hour. One of those pods carries the central bank governor, who recently started her second term. As part of her morning routine, she swipes through a hologram of news videos curated by a digital assistant, before arriving at Threadneedle Street. I would like to consider the possible impact of three innovations – virtual currencies,new models of financial intermediation, and artificial intelligence. Are you ready to jump on my pod and explore the future together? As one of your fellow Londoners – Mary Poppins – might have said: bring along a pinch of imagination! Let us start with virtual currencies. To be clear, this is not about digital payments in existing currencies – through Paypal and other e-money providers such as Alipay in China, or M-Pesa in Kenya. For instance, think of countries with weak institutions and unstable national currencies. Instead of adopting the currency of another country – such as the US dollar – some of these economies might see a growing use of virtual currencies. Call it dollarisation 2.0.
International Monetary Fund (IMF) experience shows that there is a tipping point beyond which coordination around a new currency is exponential. In the Seychelles, for example, dollarisation jumped from 20% in 2006 to 60% in 2008. For instance, they could be issued one-for-one for dollars, or a stable basket of currencies. Issuance could be fully transparent, governed by a credible, pre-defined rule, an algorithm that can be monitored… or even a “smart rule” that might reflect changing macroeconomic circumstances. Instead, citizens may one day prefer virtual currencies, since they potentially offer the same cost and convenience as cash – no settlement risks, no clearing delays, no central registration, no intermediary to check accounts and identities. If privately issued virtual currencies remain risky and unstable, citizens may even call on central banks to provide digital forms of legal tender. So, when the new service economy comes knocking on the Bank of England’s door, will you welcome it inside? Offer it tea – and financial liquidity? This brings us to the second leg of our pod journey – new models of financial intermediation. Today’s central banks typically affect asset prices through primary dealers, or big banks, to which they provide liquidity at fixed prices – so-called open-market operations. But if these banks were to become less relevant in the new financial world, and demand for central bank balances were to diminish, could monetary policy transmission remain as effective? All this, of course, has regulatory implications. More counterparties imply more firms falling under the central bank’s regulatory umbrella – which is the price to pay for liquidity on a rainy day. Whether the future holds more or less rain is an open question. Still, better regulating shadow banks looks all the more pressing. The Financial Stability Board (FSB) has already made progress in this area under the leadership of Mark Carney, chair of FSB and the Bank of England governor. The remit of central banks will grow, and with it, perhaps, public scrutiny and political pressures. Independence – at least to set monetary policy – will need further defenses and require even clearer communication. All this is good for lawyers, but not so good for regulators. The regulators will likely have to further expand their focus, from financial entities to financial activities – while possibly also becoming experts in assessing the soundness and security of algorithms. Easier said than done. To make things smoother – at least a bit – we need dialogue. Between experienced regulators and those regulators that are just beginning to tackle fintech. Between policymakers, investors, and financial services firms. And between countries. Reaching across borders will be critical as the focus of regulation widens – from national entities to borderless activities, from your local bank branch to quantum-encrypted global transactions. The stakes – and gains – from cooperation are high. We want no holes in the global financial safety net, however much it gets stretched and reshaped. I am convinced that the IMF has a strong role to play in this respect. But IMF will also have to be open to change, from bringing new parties to the table, to considering a role for a digital version of the Special Drawing Rights (SDR, supplementary FX reserve assets defined and maintained by the IMF). Which brings us to the third and final leg – the transformative effect of AI. Will our governor in 2040 walk into the Bank to polish a monetary policy-setting machine? Will the prediction made by Andy Haldane, Bank of England’s chief economist, of 15 million jobs being automated in the UK, affect the bank and its world-class staff? One thing is clear: we always have more data. Some estimates suggest that 90% of the data available today was generated in the past two years. This is not just information on output, unemployment and prices, but also behavioral data on the quirks and irrationalities of the homo economicus. Thanks to smartphones and the internet, this data is now abundant, ubiquitous, and increasingly valuable as we pair it with AI. AI is taking immense strides. Over the past year, some of the world’s best players of Go, the ancient board game, have lost to a self-learning computer. For many, that day of reckoning was supposed to be decades away. The machine learned tactics, recognised patterns, and optimised its game – better than we could. Clearly, the economy is vastly more complex than a game of Go. But over the next generation, machines will almost certainly play a larger role – in assisting policy-makers, offering real-time forecasts, spotting bubbles, and uncovering complex macro-financial links. Even if that hurdle could be overcome, a last one remains. Even with the best algorithms and machines, targets will be missed, crises will occur, mistakes will be made. But can machines really be held accountable – to the young couple unable to buy a house, to the working mother finding herself unemployed? Accountability is key. Without it, we cannot have independence; how else to bestow so much power in a technocratic organisation? And without independence, policy is bound to go astray, as this conference reminds us loud and clear. So there will always be an Old Lady living in Threadneedle Street. And I hope you agree that it is often enlightening to speak to a lady of a certain age! As our pod journey comes to an end, some of you may wonder about my upbeat tone. For many, this new world of central banking is less Mary Poppins, and more Aldous Huxley: a “brave new world”, much like the one described in Huxley’s famous novel. I believe that we – as individuals and communities – have the capacity to shape a technological and economic future that works for all. We have a responsibility to make this work. 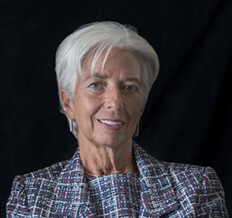 By Christine Lagarde, managing director of IMF, speaking at the Bank of England conference in London in September 2017. Bank of England says responses to messaging standard were “largely supportive”.